Coffee shops have been asking for customers’ names to write on the coffee cups for a long time now, and for the most part it helps keep the wrong person from getting your coffee – but isn’t there a more fun way to make that happen? But of course, and NY design company Hypersonic have it. It’s called the Barista Bot, and it’s probably the most fun you’ll ever have watching hot coffee sprayed anywhere near your face. The bot snaps a picture of you when you order, then after your drink is made it draws a picture of your face in the foam. The picture isn’t perfect, but it’s pretty dang good for a robot sketching you on the fly. 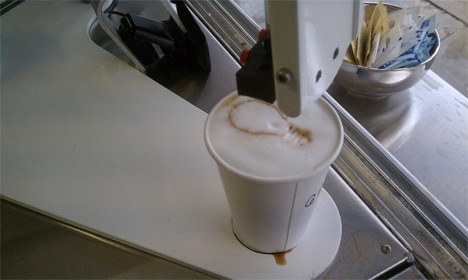 The Barista Bot isn’t meant to be used in the everyday coffee shop, however – it was just a project for SXSW 2013. But that’s probably a good thing since the several seconds it takes to draw a foam picture is far too long for most coffee addicts to wait.